Even the best printers in the world require maintenance from time to time. Moving parts within the machine will get worn down, causing issues like streaking and paper jams. For this reason, many manufacturers offer maintenance kits that consist of replacements for key components within the printer. No two models are exactly the same, so different maintenance kits may include different parts. When a printer is built, the manufacturer decides on a number of pages that can be printed before maintenance is required. After each interval of that number of prints, a warning message may be displayed. The machine will still operate, as this maintenance is simply preventative, but it is recommended that you use a maintenance kit to keep your machine running smoothly. For those with a Xerox printer that uses solid ink, a maintenance roller is available . This roller consists of silicone oil that will lubricate and clean the drum when installed. Laser printers use a powder toner that will typically flake off the drum, but these Xerox printers use solid sticks of ink, much like wax. The wax is melted in order to be applied to the paper, and this can cause a build-up on the drum. The maintenance roller will get rid of that. 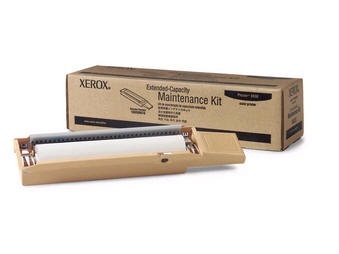 Some models offer extended maintenance rollers, such as the Xerox 108R00676, which will last more than twice as long as the standard roller. Component What purpose does this serve? What could happen if this is not maintained? Transfer rollers Transfer rollers are electronically charged and do the job of transferring the toner to the paper. 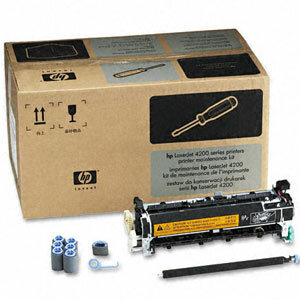 Toner will not transfer in the spots the rollers are damaged, which will create white or faded lines on the prints. Fuser The fuser consists of two rollers that implement heat to fuse the toner to the fibers of the paper. Toner will not be properly fused and will be loose on the paper, causing streaking and smudging. Pickup rollers (quantity will vary based on number of trays) Pickup rollers are used to pull sheets from the input tray to be fed through the printer. The paper will not be picked up, or multiple sheets will be picked up at once. Separation pads Separation pads coincide with the pickup rollers and essentially push the paper in the right direction so it can pass through the printer smoothly. The sheets of paper will not be aligned correctly, consistently causing paper jams and misfeeds. Corona assembly The corona wiring within the printer provides the electrical charges to the drum, toner and paper. Damage to the corona wires will virtually disable the printer as laser technology is based on electrical charges. Fan assembly The fan assembly provides a gentle current of air that keeps the paper flat when it enters the printer. Paper can jam, get wrinkled or bunched up, and curl without a functioning fan assembly. Printers are designed to handle various volumes of daily tasks and each will have different maintenance intervals. Refer to your printer’s manual to find out the recommended cleaning cycle. Maintenance kits can be purchased directly from the manufacturer or from various online vendors. Using maintenance kits at the recommended time will extend the life of your printer and ensure the highest quality of prints.